The Carleton Men’s Lacrosse team is a competitive college lacrosse team that both competes against the nation’s top teams, and provides an inclusive atmosphere. 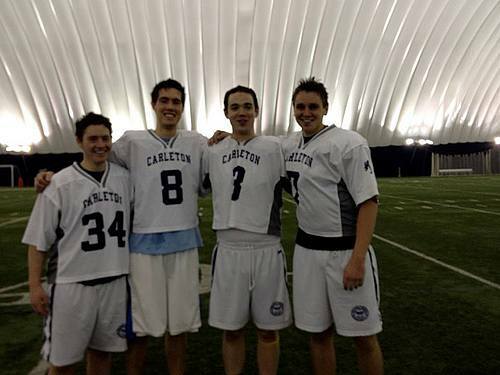 The Carleton lacrosse team prides itself on its openness to all skill levels as it hosts everyone from high school All-Americans to new beginners. We recently changed leagues, so we now play in the Great Lakes Lacrosse League (GLLL). Our division includes private colleges and state schools from Minnesota, Iowa, Wisconsin and the Dakotas. Each year we play in the league’s postseason tournament in Madison. We have finished in the top 8 (out of 32) in the league each of the last two years. The club is open to players of all skill levels, and prides itself on being great fun while staying highly competitive. 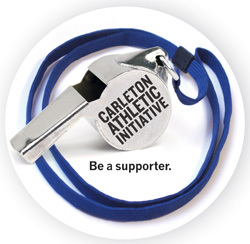 If you are interested in lacrosse at Carleton, we highly encourage you to fill out the website’s contact form. Go Knights! Led by four year starters Will Tynan (’11) and Courtney Morris (’11) the Carleton Men’s Lacrosse team made the UMLL playoffs for the third consecutive season. Playing without a true head coach (but under the guidance of Ed Buchwald) the team rallied from a slow start to win three straight league competitions and clinch a spot in the playoffs by a combined score of 40 – 25, including a thrilling 13 – 12 victory against UW Eau Claire. The Knights made the UMLL playoffs for the second consecutive season in 2010 despite heart wrenching losses at Bethel (13 – 14) and against UW Eau Claire (12 – 13). The team was spurred on by exhilarating wins against St. Olaf (17 – 15) and North Dakota State University (7-6) and the incredible play of a young core of players including freshman Dave Abel and sophomore Billy Shapiro, who, hobbled by an ankle injury early in the season, contributed five goals against St. Olaf, and was named a junior captain at the end of the season.